My mom, Patti, and I decided to go to the big AQS Quilt show in Paducah, KY on Sat. We left around 5:30 a.m, shopped at Hancock's of Paducah Fabric Outlet from 8:30-10:30, went to the vendor pavillion from 11:00-1:30, saw the displayed quilts from 1:45-3:00, then finally had lunch/dinner and headed back the 2.5 hours! 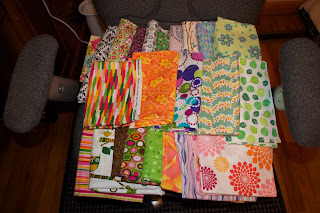 ALL DAY - ALL QUILT! I scored some awesome fabrics at Hancock's. Including the new Robert Kaufman On a Whim 2 line, with really adorable owls!